Crunchy, hand woven palm leaf on the outside and natural fibers and shredders on the inside make this shredder toy "Two Toys in One". Your bird will have so much fun tearing and chewing the outside of this wonderful shredder toy only to find out there is more shredding material inside. This shredder pinata bird toy is a personal favorite of my flock because of its unique surprise filled center. 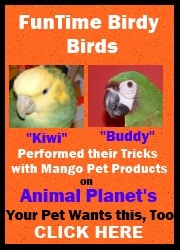 Great bird toy for birds that feather pluck or tend to over preen.